This even though simple, sounds delicious. Sometimes all you need is a simple cupcake to please a crowd, espcially kids. But you made it with elegance and 85% cacao! Wow! I wish I could watch you bake, seriously. A strawberry ganache filling sounds pretty exciting to me! 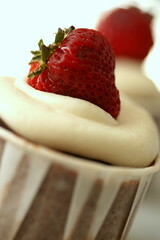 Simple, but a nice cupcake for a cupcake newbie like myself to start with… may try it with raspberries. Although, I love the look of the single strawberry on top… very festive. Keep up the great work! You cupcakes make my mouth water and my tummy rumble. These look and sound delicious! I had to get the recipe! Thanks! Looks amazing delicious as usual! I also love that I can always trust your recipes to come out beautifully every time…thanks! I’ve been on the prowl for a strawberry flavored cupcake, but I want to use strawberry preserves instead of strawberries since my grocery stores don’t have any ripe ones yet. I’m sure if i go through your archives i can find a strawberry cupcake somewhere, or maybe a vanilla one with strawberry filling. I took one look at these on tastespotting, saw the tag-line for cupcakes “frosted with chocolate glaze AND buttercream” and immediately dubbed these as heinously delicious. Honestly, I don’t know how you do it. So extravagant, so fantastic. My favorite of yours so far is the eggnog cupcake recipe posted a couple of years ago. Spectacular. I’m going to have to give these a try. I disagree–these *are* super exciting. They sound (and look) fabulous! This came just in time! I have a whole flat of uneaten strawberries! Yum! That photograph is wonderful, I know I am going to give these a go without even having to read the recipe! Fun!! 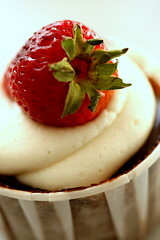 This kind of reminds me of my peanut butter filled vanilla cakes with strawberry cream cheese. My ‘ganache’ didn’t quite turn out so I put it on the top of the cupcake more like a paste. One of my coworkers said it was like having a meal. Hahhaa. Fruit and pb…balanced diet! i do love classic flavours like this and is pretty too! the strawberry chocolate ganache got me first though. that’s going to be done some time soon i reckon. cheers. Great minds… I was also in a chocolate/strawberry mood recently. I did strawberry buttermilk cupcakes with a strawberry baked inside, topped with a strawberry chocolate ganache (glaze thickness) and then spooned heaps of chocolate mousse on top. They were also a big hit. Whenever I come to visit you I always feel like I have arrived in Cupcake Heaven! Honestly I don’t think I could pick a favorite. I’ve been reading and drooling over your website for awhile now. So today I made these cupcakes, they seemed wet on top but my toothpick came out clean so I took them out. But then they fell in the middle while cooling. What did I do wrong? I’m sure it has to do with the baking soda or powder right? I also have the ganache made too. What should I do with it now? These sound delicious! You are so creative! Could this be done with white chocolate as well? I don’t know if that would affect the ganache, but I love the white chocolate / strawberry combination. I also made them, but had the same falling problem as the last commenter. I played with the fill amount, and added flour but just couldn’t make them work. I accredited it to my elevation (living in Denver is a nightmare for my baking skillz). I had to do a quick subsitute with boxed mix cupcakes. They turned out OK, but when I added the strawberry ganache and buttercream they were REALLY good. If you wanted to make a bigger batch, would you double the recipe or just make two seperate batches? I get nervous when baking of just doubling everything. These look amazing, but I need to make more then 8. This looks inviting. Perfect for my kids and their friends. Found your blog via todayscreativeblog and am loving it! I’m definitely motivated to make cupcakes for Mother’s Day now. Thanks for the inspiration! Thanks for sharing a great recipe! I just tried it and I love how it looks & tastes. I am VERY new to cupcake baking, but I had fun. It reminds me of molding chocolates, except I’m making shells with cupcakes! I love how the ganache turned out. Maybe I should try it in my chocolates. :) My next adventure will be making similar cupcakes with raspberries. Thanks again for great blog & recipes!! IT looks very delicious and so cute~! I’m really interested in cupcakes~! I wanted to make cakes several months ago. BUT now! I wanna make some cute cupcakes than great cakes~ because of your lovely cupcake~! I just made them. Have yet to sample but they look delicious. Did I screw up or are the cupcakes meant to be a bit more dense? I always love your recipes, without exception. And not one has failed on me yet!! This looks beautiful. I can’t wait to try it. Wow! I made these and everyone loved them. I really enjoyed the contrast between the sweet buttercream and the bitter ganache. I made these for my auntie’s birthday, only with raspberries and mocha frosting…a little chocolate heavy for me but auntie loves them so I’m happy! These are the first of your cupcakes I have made (despite spending numerous hours drooling over your posts). I made them for a friend’s birthday and then went down a treat!! Absolutely delicious. Thank you!! Oh God this looks heavenly! I think a raspberry filling will also taste good! I did a simpler version of these for my b-day party and they turned out super delicious. Even though the cupcakes collapsed during cooling, they were the yummiest chocolate cupcakes I’ve ever tasted! Not too sweet, very chocolaty and both crunchy and moist at the same time. Paired with the rich vanilla buttercream and fresh strawberries they were perfect. I stick is 1/2 cup which is 113.4 grams. There are online tools that help you convert. Just search google or something for what you are looking for. I just started reading this blog too. I’m about to make these in a couple days, and I’ve been reading the reviews. Does anybody know how to make sure the cupcakes don’t fall and sink in the middle when they’re cooling? Two things – don’t overfill the cupcake cup (around half full – no more!) and make sure your oven is hot enough. If they don’t rise over the top they are fine. If there is too much batter they will rise over the top and deflate some. Made these today and they were great! Thanks for the awesome recipe! thank you for the recipe! I love your website. Very interesting set of cupcake recipes. I tried this one today and the cupcakes sank as I took them out of the oven. I think I followed most of the instructions….filled the cups (I ordered the same ones that you have on your website) 2/3 way full. The batter divided equally among 8 of these cups 2/3 way full. The taste of the cakes is really good. Just batter popped out of them all except just one. I made these the night before my kiddo’s birthday party, and I was distraught when they fell. The next morning, with a little bit of science help from Baking Illustrated, I omitted the baking powder entirely, and doubled the baking soda. The cakes were perfectly even, delicious flavor, had an excellent crumb and no more drama. The culprit? Natural cocoa vs. Dutch processed. I just made these cupcakes! I LOVE them, easy and they look and taste gourmet!